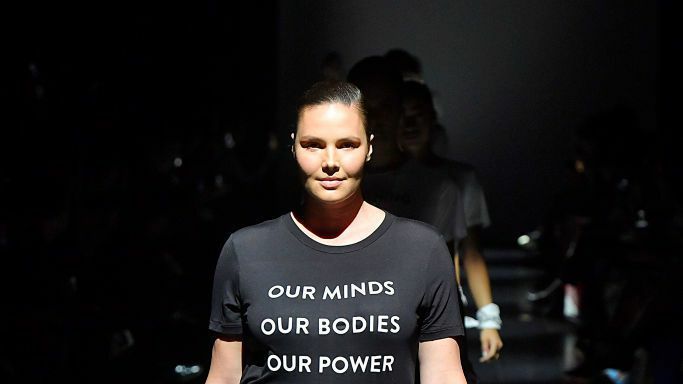 Prabal Gurung's show last night was an act of political and body positive activism. Before wrapping up, Gurung himself walked out in a tee of his own. "This is what feminism looks like," it read. When asked by The Hollywood Reporter what prompted him to take the pro-women stance, he explained, "...having come from where I come from—from Nepal and a single mother who brought us up—it's been my thing since day one." "So to me feminism is not just a trending topic," he said. "It's the only way I've known, even before I knew what [feminism] was." Thanks to body-positive models like Ashley Graham and Iskra Lawrence, plus-size models have certainly been gaining notoriety, but there's no denying that the industry still has a long way to go. That said, for a reputable designer like Gurung to practice body diversity at a platform like New York Fashion Week is definitely a step in the right direction. Here's hoping we catch a glimpse of more empowering moments like this throughout the week.